A few weeks ago we wrote about how the creation of Lake Barkley forced the relocation of entire towns, specifically Kuttawa, Ky. Both Eddyville and Kuttawa were impacted the most by Lake Barkley, but you can find all sorts of buried discoveries up and down the shorelines, especially at winter pool. When USACE and TVA (Tennessee Valley Authority) lower the lake’s level in the fall, all sorts of stuff emerges from the mud. One can find remains of homes, fences, old roads and bridges, or just about anything else imaginable. 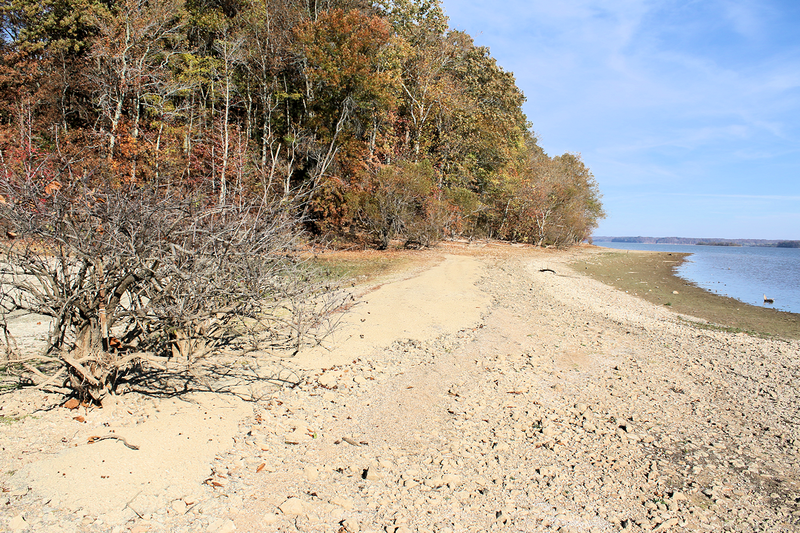 With Lake Barkley’s level at winter pool (the lowest the lake usually gets) and with exceptionally dry conditions, we recently set out to explore the Shanklin Creek area of Lake Barkley, located just north the US 68 bridge on the LBL side of the lake. Shanklin Creek is fairly large, covering somewhere in the neighborhood of 12-15 acres. In the summertime when Lake Barkley is at its normal level, the bay averages a depth of three or four feet. 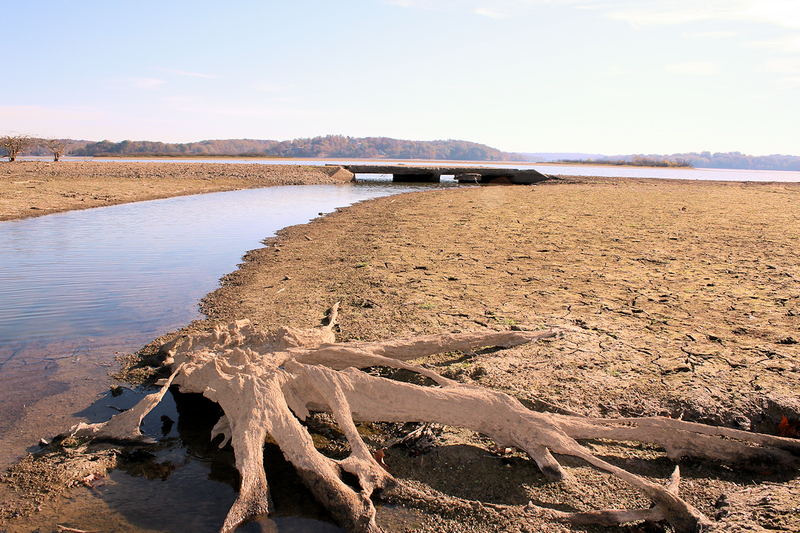 In the fall and winter months during winter pool, the bay is dry. Pavement still exists from the old road that travels through Shanklin Creek bay. This map from 1937 shows Kentucky 289 before the creation of Lake Barkley and Land Between The Lakes. Click for a larger version. Exposed during winter pool is the remains of an old road – specifically a state highway that was once Kentucky 289. This road paralleled the Cumberland River on the west side and contained many farms and homes located along the route. It even served our “haunted campsite” in LBL. 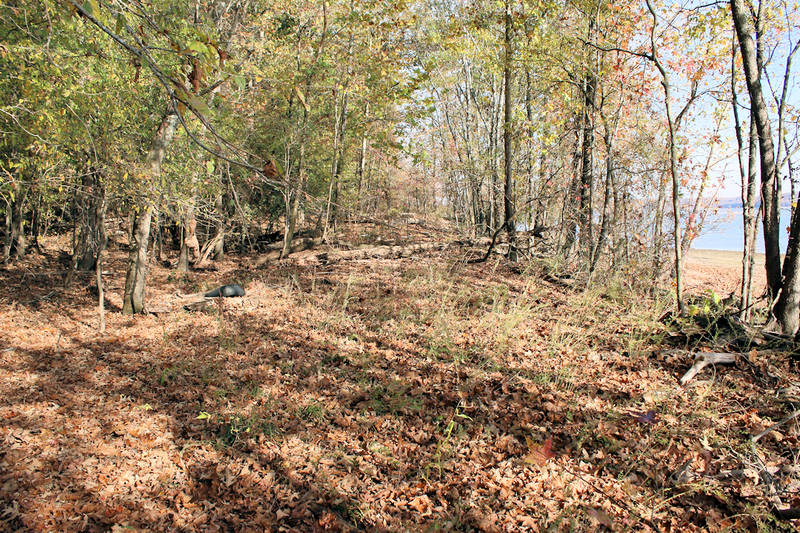 Cars haven’t traveled this road since Lake Barkley was created – likely sometime around 1965, but some of the road’s original pavement is still intact. The most prominent feature is a concrete culvert, probably about 25 feet long or so. As I walked across it, I couldn’t help but wonder how many boats have hit this thing. It’s in the middle of Shanklin Creek and right along the edge of the main lake. At summer pool, it’s probably just about three feet or so under the water. This tree was likely cut when workers were clearing land for Lake Barkley in the 1960s. The old culvert is in the background. Kentucky 289 crossed the bay of Shanklin Creek and went into some woods. Although some saplings have sprung up and trees have fallen across it, the pavement is still mostly intact. 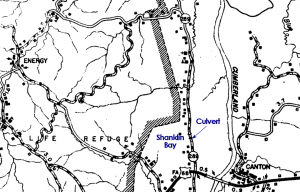 We didn’t go far down, but I bet walking along the old road would yield additional discoveries of former homesteads. If you want to check out this specific part of the shoreline of Lake Barkley, here’s how to get there. Take Energy Lake Road near the Lake Barkley Bridge on US 68. Go about a half-mile to LBL Road 158. Go about a quarter-mile or so until you’ve reached a backcountry campsite near the lake. There is a steep, impassable lane going down the hill. Park at the top and walk down the hill. You’re at Shanklin Creek. At the time of this writing (November 2016), LBL Road 158 might be too much for cars that ride low. You’ll need a vehicle that has decent ground clearance or you’ll bottom out. The road is a bit rough. 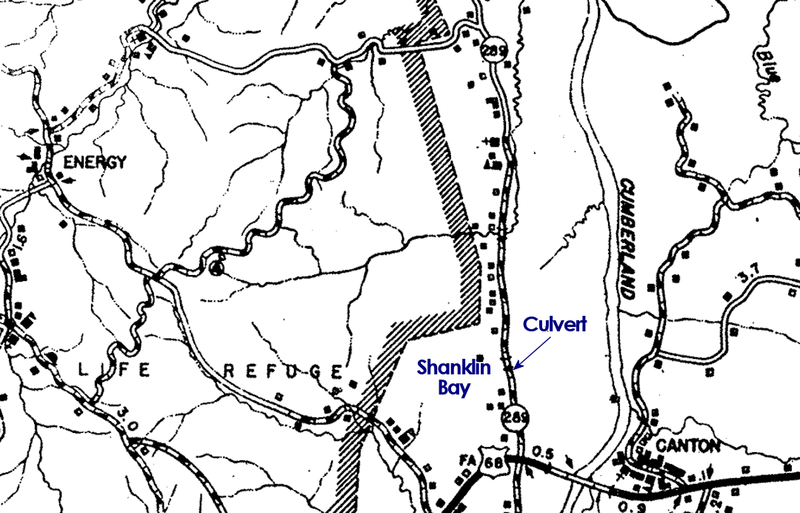 This map shows Lake Barkley just below summer pool. 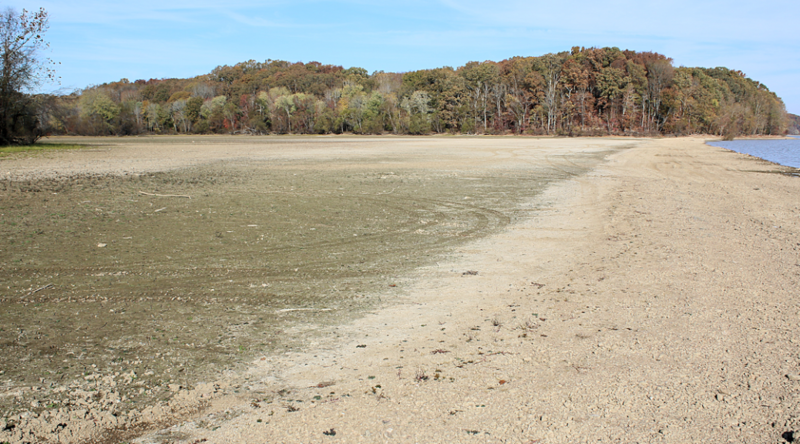 During winter pool, Shanklin Creek is dry. You can make out the outline of old Kentucky 289 clearly. 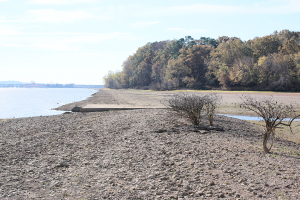 Lake Barkley’s level needs to be at or below 355.0′ to explore this area. Check Lake Barkley’s level here.